For the Love of Chocolate. Regular readers of this blog know I fall back on re-reading my 1985 diary for inspiration when all else fails. Two entries from October 1985 I find interesting. I make no comment as to the rights and wrongs of such actions. Suffice to say it was probably indicative of a bygone era and certainly not 'PC' by today's standards. I would love to hear what you think. What a simple, unexciting life I lead in1985, that I recorded such matters! Out of interest, can you still buy Terry's Moonlight chocolate? Finally, a 'choclaty' story', as Kenny Everett would say, 'In the worst possible taste'. A Ramble Round the Body; Fingers, Toes, Even a Nose. 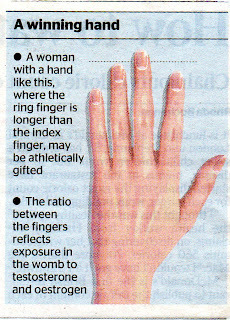 For no particular reason fingers made the news recently; medical research brought into the spotlight some interesting suggestions. Most men have ring fingers that are longer than their index fingers. 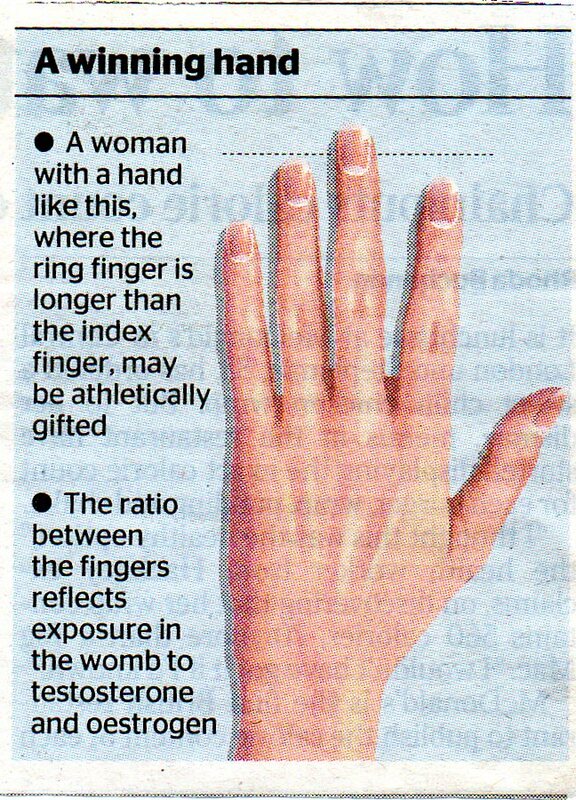 Most women have longer index fingers or fingers of approximately the same size. Now the fun starts. Some research findings, I suspect to be taken with a pinch of salt! I'm not clever enough to be a scientist. I'm just someone fascinated by life and the idiosyncracies of people. Millions watched Strictly Come Dancing on television last week. The intricate dances, the skill, the glamour, the razmataz. And do you know which bit fascinated me most. The fact that Audley Harrison has size 17 feet! I remember a pair of boots in a shop window in Derby made for a man in Melbourne; they were size 22! 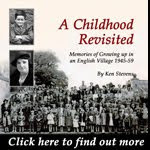 Now why would I remember that from probably fifty plus years ago! But lose that curiousity and you might as well give up on living. I have some small toes that are longer than my big toes, if you know what I mean. Somewhere back in history an ancestor must have had that trait and it is being repeated, presumably for ever and a day; isn't nature clever. (Or perhaps someone picked me up out of the pram by my toes.) My eldest daughter has a party trick. She can touch the end of her nose with her tongue. Try it, is there anyone out there who can do this? Or anyone out there with a party trick they wish to share! Come to think of it, looking at my faltering visitors of late, is there anyone out there full stop! Talking of noses, a clip that might well amuse. A blast from the past, Chick Murray and his 'long nose' story. Some of you may well be amused; who nose!! Labels: Audley Harrison, Chic Murray, Derby, Melbourne, Strictly Come Dancing, Vitruvian Man. Cheerio September, Mad, Bad and Sad as Usual. Grumpy's Alternative News. So much to reflect on, where to begin. A couple of bankruptcies, definitely not a subject mentioned before. The Solicitors from Hell website has been declared bankrupt. (You could put complaints on their website for a fee.) Result, sixteen libel actions against them, result £150,000 in outstanding judgements. 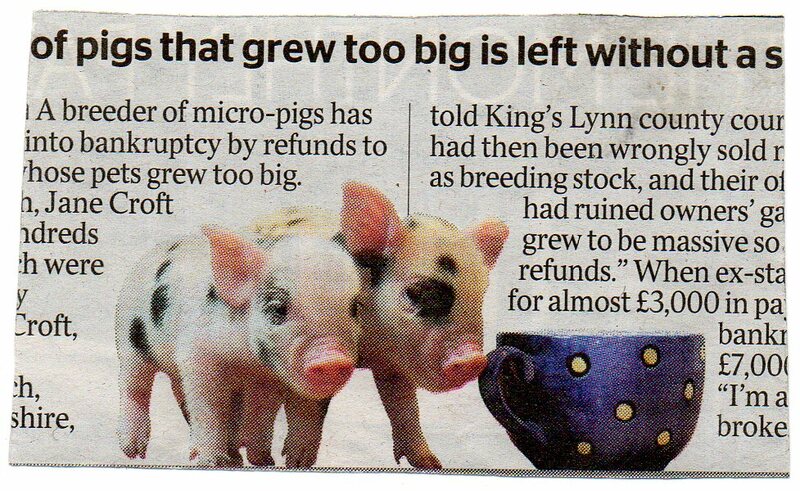 And a breeder of micro pigs in King's Lynn has been made bankrupt because many of her pigs grew too big and wrecked gardens so so she refunded the £650 they cost. Let's talk some more money. A road safety camera in Cardiff, cost to install, £20,00 went off once last year, realising £60. (89 fixed cameras on the M4 in South Wales brought in £706,020.) And a £1,000,000 note, one of the only two ever printed sold for £67,000 at auction in London. (Issued by the treasury in 1948 in connection with the US Marshall Aid programme.) 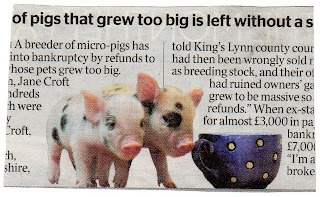 By the way, a survey has recently shown over 90% of Britons do not know what a BANK SPREAD is. 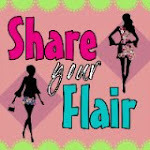 Include me in the 90%! Talking of surveys, a recent survey by Debenhams suggested 85% of British women were wearing the wrong bra size. Grumpy's full of useful information! Anything else you wish to know. Scotland, England, Wales, take your pick. A woman from Inverness has become the mother of Britain's biggest baby girl, weighing in at 12lb 9ozs (5.7kg). A rare ladybird, the 13 spot ladybird, thought to be extinct for over 60 years has been found in Devon. A school in South Wales, the Glyn Primary is to stay open for the rest of this academic year. It has two pupils and a head, a deputy head, a part time teacher, a teaching assistant, a dinner lady, a cleaner and a caretaker! The wife of MP John Hemming, MP Lib Dem for Yardley, breaks into his mistresses house and steals her kitten. (caught on CCTV). Evidently he leads a life style that has no regard for what is thought of as 'normal'. He thinks of himself as well above the little people, ie voters, who have put him in a position of power. Leaked US diplomatic cables throw an interesting light on Mayawati, the most senior politician from the Indian 'Untouchable' caste. One cable relates her sending her empty private jet to retrieve new sandals from Mumbai. Described as 'a first rate meglomaniac', she made a state minister do sit-ups as punishment for minor errors of protocol. Three examples of the saying, power corrupts, absolute power corrupts absolutely. Just one or two other items that caught my eye. Deborah Hunt, an unemployed financial advisor, drove, not one mile, not five miles but twenty three miles the wrong way up the M5. She said her recollection of the event was 'hazy'! James Ellis, 18, stabbed his girfriend to death in Liverpool. It must have been something of great importance to cause such a terrible crime. Oh yes, it was an augument over garlic bread! What an horrific example of total loss of self control. Finally I see we 'oldies' are more than holding our own. 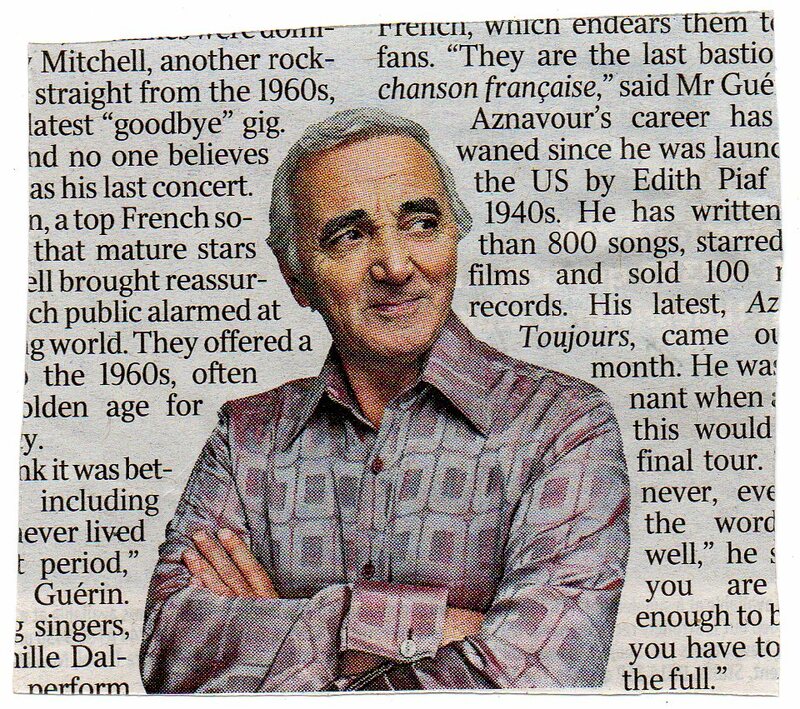 Charles Aznavour has set out on a three month tour. Not bad at eighty seven. Plus Johny Hallyday, a mere sixty eight, opened in Paris in Tennessee Williams play, Kingdom of Earth. Many more 'oldies', seventy plus, come to mind: Sir Michael Parkinson, Michael Winner, Sheila Hancock, Sir Terry Wogan, Dame Vera Lynn, all have very active lives. Evidently Kirk Douglas still blogs regularly on his MySpace account at ninety four. Mind you, it ends one day for us all, rich or poor. And I hope we all go with dignity. Joy Tomkins, aged eighty one from Downham Market has no desire to stay when her time's up. She has had the message 'Do Not Rescusitate' tattooed across her chest, and in case medics miss the message, 'PTO' across her back! Death will certainly curtail most of your activities but fear not, travel need not be one of them. William and Alice Green always wanted to travel. So when they died their daughter advertised via Craiglist, the classified ad site for people to transport and scatter small portions of their parent's ashes to wherever they wish in the world. Never one's to travel when alive, the have now posthumously visited Paris, Amsterdam and Las Vegas. And when visitors to Hawaii, England and Australia are found, the Green's world tour will recommence. Happy travelling, folks. 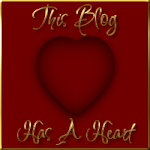 Don't forget you read it here first! Bristol. A man stabbed his wife with a 14 inch kitchen knife. Her life is saved because the blade caught the wiring of her bra, enabling her to fend him off and escape. A good job she wore a bra! High Wycombe. Four British tourists holiday in Peru. They book a flight in a Cessna 185 from a remote site. A last minute arrangement, the pilot is flustered, and is over the alcohol limits for pilots. He forgets to switch on the fuel, the plane almost immediately crashes, all are killed. Couldn't happen to me, I only go to Skegness. Wait a minute, Skegness does flights round the town and back! Bradford. A man falls backwards into a clothes-dryer; the dryer collapses. His head lodges between the rails. He struggles to free himself, makes matters worse and he suffocates. A coroner said the incident was 'probably rarer than being struck by lightning or struck by a meteorite'. Connah's Quay. A Mr Michael Dunn from Connah's Quay, Wales goes all the way to Australia for a military exercise in Brisbane. He goes to use a portable toilet. The toilet explodes whilst Sergeant Dunn is inside. Cause unknown but probably a fuel spill. No matter, Sergeant Dunn is killed and is awarded a full military funeral. Cardiff. Mohammed Ali Ege has problems with a man who owes him money. He is a bad man, is Mohammed Ali, and pays two men to kill the debtor. The two 'hitmen' are not over bright, plus high on drugs. They go to the wrong house, in the wrong street and kill the wrong man. Sadly very much a case of being in the wrong place at the wrong time. Galway Michael Fahery, aged 76, was found totally burnt in his home. The only damage to the property was above and below him. The coroner's verdict, he died of 'spontaneous human combustion'. Now some say such a thing is impossible, but a coroner is a learned man; you cannot take his verdict lightly. There you have it. All examples of FATE? You tell me. And just for a complete tease. Niall Pawsey, a law student from Cheltenham had a bet with friends that he could go for a month without drinking alcohol. He won his bet and they all celebrated. A further bet was that Neil could swim across the Thames at Kingston in Surrey. Unfortunately Niall lost this bet, his luck??? was out and he paid with his life. Jeni Anderson, a 23 year old student fell overboard, in the dark from a ferry 20 miles off Scarborough. A lifeboat from the ferry picked her up thirty minutes later, cold and frightened, but very much alive. You could truthfully say her time was NOT up. What do you reckon?